Although modernism has traditionally been considered an art of cities, Ecocriticism in the Modernist Imagination claims a significant role for modernist texts in shaping environmental consciousness. Analyzing both canonical and lesser-known works of three key figures - E. M. Forster, Virginia Woolf, and W. H. Auden - Sultzbach suggests how the signal techniques of modernism encourage readers to become more responsive to the animate world and non-human minds. Understanding the way these writers represent nature's agency becomes central to interpreting the power dynamics of empire and gender, as well as experiments with language and creativity. 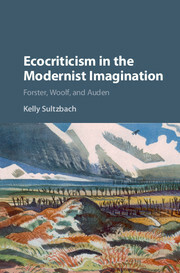 The book acknowledges the longer pastoral tradition in literature, but also introduces readers to the newly expanding field of ecocriticism, including philosophies of embodiment and matter, queer ecocriticism, and animal studies. What emerges is a picture of green modernism that reifies our burgeoning awareness of what it means to be human within a larger living community. 1. Passage from pastoral: E. M. Forster; 2. The phenomenological whole: Virginia Woolf; 3. Brute being and animal language: W. H. Auden; Epilogue. Kelly Sultzbach is a professor at the University of Wisconsin, La Crosse. Her research explores modernist representations of the relationship between humans and the environment. Published and forthcoming work can be found in Global History of Literature and the Environment, Understanding Merleau-Ponty Understanding Modernism, and Green Letters: Studies in Ecocriticism.